I like girls with pipes that don’t quit. It’s a thing. I like ‘em. Like a lot. But, sometimes well honed talent just isn’t enough to push someone to the top of Kpop.You’ve gotta have a certain look and a certain feel. I realize that it is a sweeping generalization — I, myself, have written about all sorts of pretty amazing female singers in the Kpop World — but I have to say, far and away, the average female idol has a pretty hollow voice. They can carry a tune, they can (for the most part) dance, and they look very, very pretty. I don’t mean to disparage only the lady idols either, the same holds true for the guys. Now enter Choi Ye Geun…She is AMAZING. Girlfriend can sing. 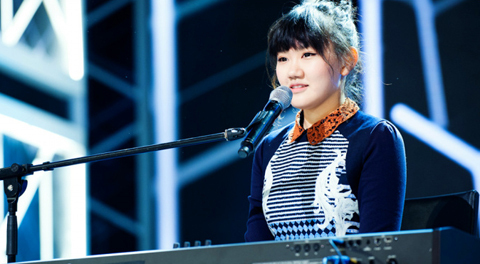 Sing with a capital S. She was a contestant on K-Star 2 during the same season as Akdong Musician and did fairly well…but obviously, she didn’t win. I don’t fault the outcome, we all know how I feel about those darling siblings, but I wish she had come away from the show with something more than a contract with a small agency and very little exposure. She is a solo female artist that rocks the type of singing voice that could kill in a smoky jazz club or a stadium full of screaming fans. She’s got this little rasp that pops out and makes me smile. The song has a cool retro feel that just slides under your skin and sticks with you…making you feel cool all day. She plays all of the rolls in the band for the video and she is fairly convincing on most of the instruments…it’s clear she knows her way around a studio. She is ADORABLE in all of the looks for the video. I want to hang out with her. Her eyebrow wiggle is the best.